William Dyce FRSE RSA RA (/daɪs/; 19 September 1806 in Aberdeen – 14 February 1864) was a Scottish artist, who played a part in the formation of public art education in the United Kingdom, and the South Kensington Schools system. Dyce was associated with the Pre-Raphaelite Brotherhood and played a part in their early popularity. Dyce was born on the 19 September 1806 at 48 Marischal Street in Aberdeen, the son of Dr William Dyce of Fonthill and Cuttlehill FRSE (1770–1835) and Margaret Chalmers of Westburn (1776–1856). His uncle was General Alexander Dyce FRSE (d.1834). His older brother was Prof Robert Dyce FRSE. Dyce began his career at the Royal Academy schools, and then travelled to Rome for the first time in 1825. While he was there, he studied the works of Titian and Poussin. 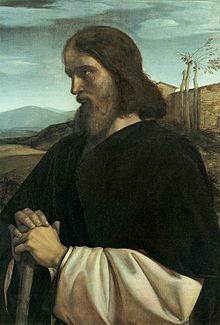 He returned to Rome in 1827, this time staying for a year and a half, and during this period he appears to have made the acquaintance of the German Nazarene painter Friedrich Overbeck. After these travels, he settled for several years in Edinburgh. He supported himself by painting portraits at first, but soon took to other subjects of art, especially the religious subjects he preferred. Dyce was given charge of the School of Design in Edinburgh, and was then invited to London, where he was based thereafter, to head the newly established Government School of Design, later to become the Royal College of Art. Before taking up this post in 1838 he and a colleague were sent to visit France and Germany to enquire into design education there and prepare a report. He left the school in 1843, to be able to paint more, but remained a member of the Council of the school. The ideas that were turned in the following decade into the "South Kensington system" that dominated English art education for the rest of the century really have their origin in Dyce's work. Dyce is less known for, but nevertheless important as, the founder of the Motett Society (1840–1852), which sought to advance the restoration and liturgical use of long-neglected works of the English church. He was noted as an able organist, and is also reputed to have composed some musical works (unverified). Dyce died in Streatham in Surrey on 14 February 1864. He is buried in the churchyard of St Leonards Church in Streatham. He is also memorialised on his parent's grave in St Nicholas Churchyard on Union Street in Aberdeen, and there is a street in Streatham named for him – William Dyce Mews. Dyce's most highly thought of painting today is his exceptionally detailed seaside landscape of Pegwell Bay in Kent, now in the Tate Gallery. A rather atypical work, it is fully titled Pegwell Bay, Kent – a Recollection of October 5th 1858, and was exhibited at the Royal Academy summer exhibition in 1860. The largest collection of Dyce's work is held at Aberdeen Art Gallery, Scotland. Dyce is the figure in Scottish art most associated with the Pre-Raphaelites. He befriended the young Pre-Raphaelites in London and introduced their work to the influential art critic John Ruskin. His later work was Pre-Raphaelite in its spirituality, as can be seen in his The Man of Sorrows and David in the Wilderness (both 1860), which contain a Pre-Raphaelite attention to detail. Later in his career, Dyce turned to fresco-painting, and was selected to execute a series of murals at the newly completed the Palace of Westminster. In preparation for work at Westminster, he returned to Italy in 1845–47, to observe the fresco techniques employed there. He was particularly impressed by Pinturicchio's frescoes in the Piccolomini Library in Siena, and by the works of Perugino. Dyce was commissioned to decorate the Queen's Robing Room in the Palace. He chose as his subject the Arthurian legends, He had some difficulty adapting the Courtly love of Malory's tales to Victorian mores. The Arthurian legend became popular later in the Victorian period, but when Dyce received the commission to decorate the room in 1847, it was still an obscure subject. The legend soon became a major problem for Dyce, as it turns on the unfaithfulness of a queen, which causes the fall of a kingdom. After initially experimenting with a narrative sequence in which the tale would unfold in the room's panels, Dyce abandoned this in favour of an allegorical approach. In their finished form, Dyce's frescoes depict scenes from the Arthurian legend that are intended to exemplify the virtues inscribed beneath them. The actions of the figures in his frescoes appear to the modern viewer to convey qualities whose status as virtues is uncertain, and the connection between the episodes from the Arthurian legend and the virtues they represent is sometimes difficult to discern. The virtues depicted are Mercy, Hospitality, Generosity, Religion, and Courtesy. Two projected frescoes, Courage and Fidelity, were never executed. Dyce was working on the frescoes in Westminster when he collapsed, and later died at his home in Streatham on 14 February 1864. He was buried at St Leonard's Church, Streatham. A nearby drinking fountain, designed in the neo-Gothic style by Dyce, was subsequently dedicated to him by the parishioners. In 1850 Dyce married Jane Bickerton Brand (d.1885). Dyce's nephew (his sister's son) was the engineer William Dyce Cay, and his niece was Meredith Jemima Brown. ^ D. Macmillan, Scottish Art 1460–1990 (Edinburgh: Mainstream, 1990), ISBN 0500203334, p. 348. ^ M. MacDonald, Scottish Art (London: Thames and Hudson, 2000), ISBN 0500203334, p. 100. ^ "The Legend of King Arthur". UK Parliament. Retrieved 5 June 2012. Wikimedia Commons has media related to William Dyce. Iian Neill. "William Dyce (1806–1864)". Art Renewal Center. Retrieved 30 January 2006. This page was last edited on 4 January 2019, at 15:24 (UTC).